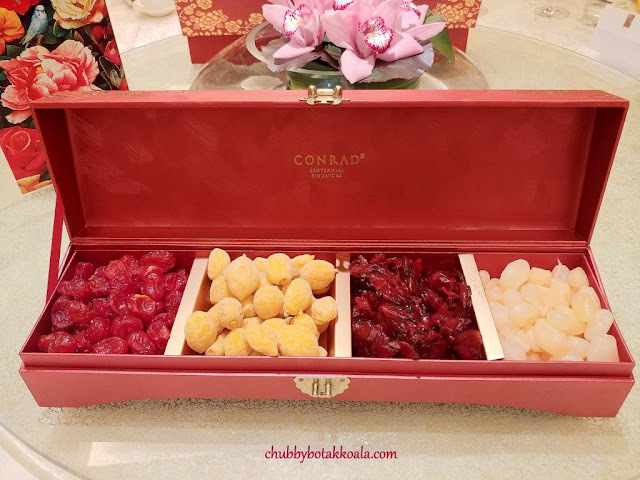 Conrad Centennial Singapore ushers in the Year of the Pig with creative and delicious culinary delights that will spice up your Reunion Dinner and Chinese New Year Celebration. We started the Media reunion dinner with a super long Lo Hei of Fortune Piggy ‘Yu Sheng’. The Yu Sheng is big enough for 30 people with plenty of leftovers. The combination of fresh and pickled vegetables, together with abalone, salmon, crispy whitebait and fish skin are good to starter for the Chinese New Year reunion dinner. On top of that, we have this mini pig made from chocolate to commemorate the Year of the Pig. 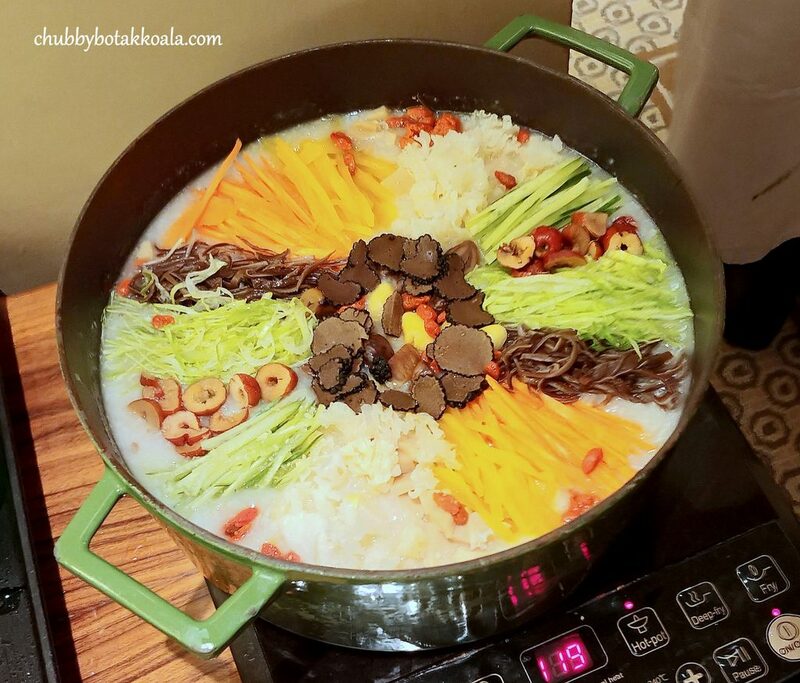 Instead of a soup dish, Golden Peony present vegetarian Eight Treasure Congee. The whole dish presentation is just beautiful, like Golden Peony version of Bibimbap. You can taste the robust broth used to cook the smooth and silky congee. Served with pickled vegetables and charcoal fried dough. The final touch is the shaved truffle and truffle oil. Not an auspicious dish served during CNY, but it was just so yummy. Steamed Star Grouper and 8-Head Abalone. This fish really represent abundance through the bounty of the sea. The flesh of the grouper is firm and springy, while the abalone is well braised. Unfortunately, due to the firmness of the fish, the abalone braising sauce is not well absorbed in the fish. Feels like two separate dishes, instead of one. Golden Maine Lobster, Butter Pumpkin Sauce, Crispy Potato Crumbs. Deep fried lobster flesh, coated with pumpkin sauce with a sprinkle of curry powder. Fragrant, crunchy, with a bit of curry kick. Roast Whole Suckling Pig, Fragrant Coconut Rice. One of the most anticipated dish for CNY gathering at Golden Peony. This is Suckling Pig x Nasi Lemak. The suckling pig is thin and crispy. It excites everyone just by listening to the crackling sound when the pig was being cut. It is stuffed with rich lemak flavour of the coconut rice and to make it more interesting, fried otah is perfectly inserted in the middle of the rice stuffing, looks like egg yolk. It is then served with sambal that is sweet and fragrant. I am not a chilli eater, however, eating this dish without the sambal is just incomplete. I gave the sambal two thumbs up. Yum Yum. The first dessert is ‘Koi’ Soya Pudding, Hasma, Peach Resin and Red Date Broth. 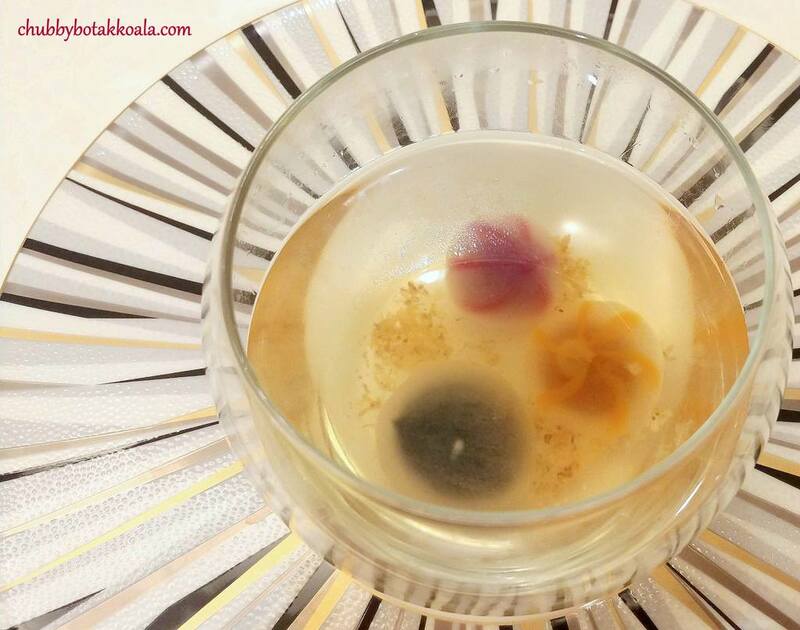 Representing a good fortune for Chinese New Year, the soy pudding Koi brings abundance of luck to the diners. The Koi soya pudding is smooth and creamy while the lightly sweeten soup bodes well with the hasma and the sweet red date broth. The second dessert is Osmanthus Broth, Rainbow Crystal ‘Tang Yuan’. The three different types of Tang Yuan are black sesame, pumpkin and sweet potato. 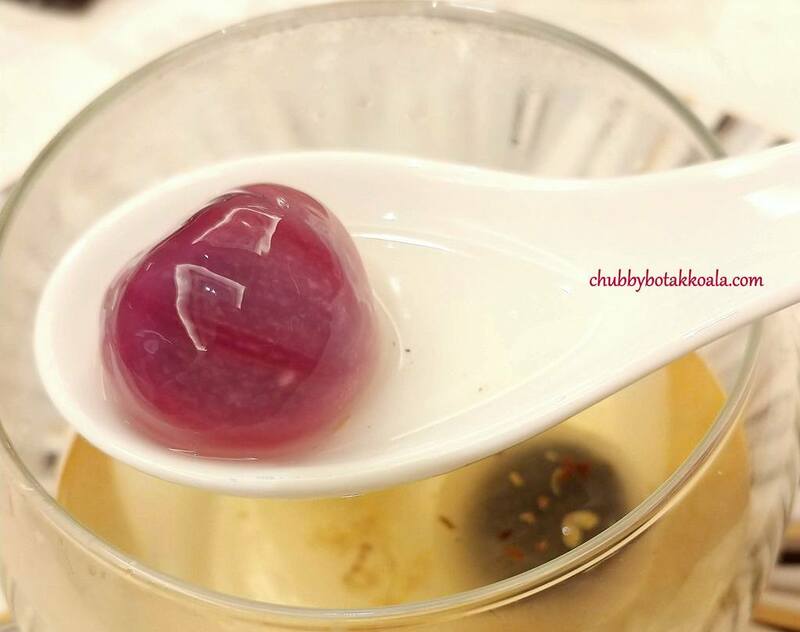 The flavours are lighter, not as bold as traditional tang yuan. I like the QQ texture of the Tang Yuan. Overall, another excellent Chinese New Year dishes curated by Executive Chef Ku Keung and his team. They really showcase their creativity in assembling the giant Yu Sheng. 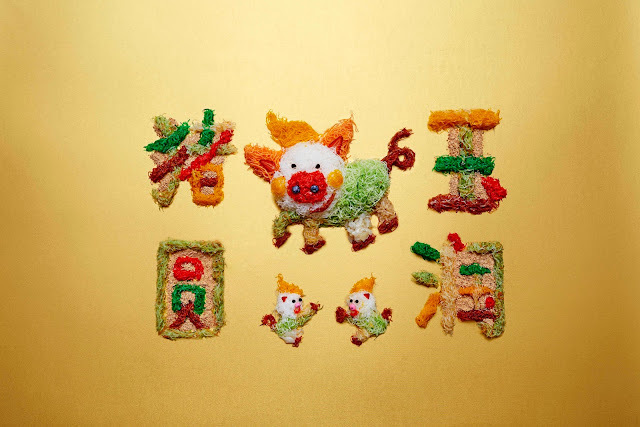 The boldness in showcasing the delicious Eight Treasure Congee for Chinese New Year definitely need to be applauded, and their “Nasi Lemak” Sucking Pig is just amazing. Golden Peony at Conrad Centennial Singapore is definitely a place to consider for Chinese New Year Celebration. Thank you very much to the Conrad Centennial Singapore for the tasting invitation. When: 21 January to 19 February 2019. Price: Lunar New Year Menu from $118++ per person or $1,398++ for table of 10 pax. Fortune Piggy looks funny in the 3rd pic. Well that's kiddish ans was meant for kids. Jokes apart, "Koi" and "Roast Whole Suckling Pig" looks great and a must try dish.